Thank you for popping by! I started of @flatlayforever in 2016 as a fun, featured account on Instagram. I can't believe how much it has grown! First of all, when I work on a flatlay, these things are always on my mind. I love a good source of natural lighting. More natural than artificial lighting. The reason being, natural lighting cast soft shadows. It brings out the beauty of objects on display. Sources of natural lighting could be right out in the open of one's backyard or simply locate rooms that are close to windows. If you live in the darkest places, be resourceful. If you need to do a flatlay and mom or bestie has the best light, I'd packed my stuff and head straight to their homes! Also, think of public spaces like cute cafes and libraries. Where there is a will, there is a way. Never give up on that flatlay dream! I love a good surface. I often find that, they always reflect one's personality. My favourite go to's are plain matte white, marble and cement top. The simpler, the better. If I find a surface is not suitable for my flatlays, I bring a backup option in the form of a white table cloth (haha!). If you're after a rustic look, plain timber surfaces make gorgeous background for flatlays. You can definitely spice it up by painting the surface in colours that you like, and sand it down later. Think of themes that you'll be doing a flatlay around. Are you doing a monochrome, a rustic or a crazy fun and colourful flatlays? The most important thing I find, is to do what you love and find a style that reflects who you are. For me, I love colours, the quirky and all sorts of cute things. When I work on a flatlay in bed, for example, I went all out, crazy style. I've seen beautiful flatlays with black and white objects. And I simply adore them. Or an old fashion themed ones with retro cameras from the 60s. It could be absolutely anything from having breakfast to arranging autumn leaves to chilling out in bed. 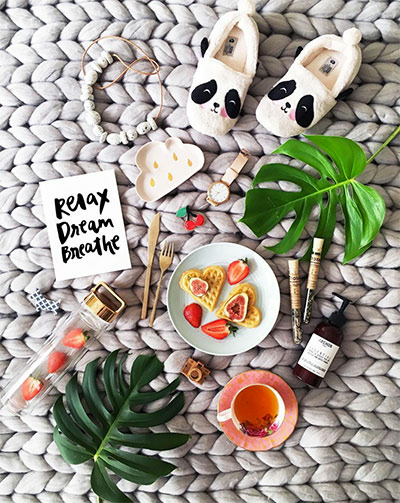 The world is your oyster when it comes to flatlays. 4. neat or organise chaos? Neat or organise chaos? An age old question in flatlays since 1990s, hehe. Depending on the objects and themes, it could go both ways. My advice would be, always give yourself options. It's "just in case" if the others did not work out, there is always a Plan B. Most importantly, have a play with your flatlays. Experimenting with different textures and themes. Take a few shots, and compare them as you go. The more you practice, the better you're at it, and before you know it, you barely even think about it when you do a flatlay! In this case, I did something that I've never done before with my photographer friend, Priscilla Barbosa, a flatlay of a Mini convertible car! We thought it was mad and the impossible. I have to say that this is my favourite flatlay ever! Hashtagging is as important as tagging featured flatlay accounts on Instagram. It is in a way, to be "seen" or to be "found". The bonus is you get to be featured! So make sure you guys use #flatlayforever. I can't wait to see all your lovely flatlays from all around the world. Keep inspiring one another.